Most people know actor Will Smith from his days as a rapper, and as the street savvy, smart-mouthed live-in in "The Fresh Prince of Bel-Air." The 32-year old actor has appeared in some of the most successful films in history: "Men in Black," "Independence Day," "Enemy of the State," "Wild Wild West," and "The Legend of Bagger Vance." 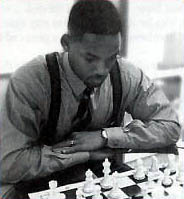 What most people do not know is that Will also plays chess. Last October, he was in Chicago filming a movie at the same time the Chicago Board of Education brought GM Maurice Ashley in town to talk to elementary school children. Will asked Maurice to help him improve his chess game and local resident NM Marvin Dandridge was recommended. GM Ashley has known Marvin for years and the two has just played a short blitz set during his visit (Ashley won 3-1). So Marvin, a fearsome player, and one who has given his share of lessons over the board, got the call and met with the famed actor for two hours. While the rate will remain undisclosed, let's just say it was probably the most lucrative two hours that Marvin has spent with regard to chess. With Will's comedic ingenuity and "Uncle Marv's" incredibly humorous wit, it must've been quite a session.